If you are using a live data connection for your Tableau Server views, then Metric Insights might not see the latest information. This is because Tableau Server is caching the older data. Also, sometimes when you publish updated workbooks to Tableau Server, Metric Insights does not see the latest changes in Tableau Server. This is the result of Tableau Server caching older information. This can occur when adding new columns to the Tableau view but you do not see them in Metric Insights. 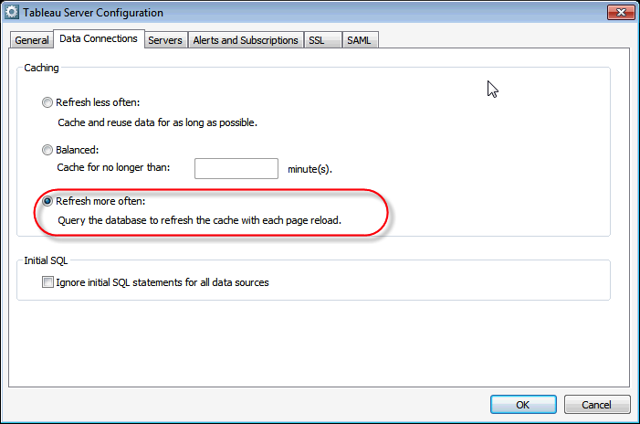 In either case, the best practice is to set the Caching parameter to refresh more often. This ensures that Metric Insights sees the latest information in the Tableau Server views. If using a live data connection, or publishing an updated version of your Tableau workbook, then setting the Caching to "Refresh more often" will ensure that Metric Insights always sees the latest information.